Inspired by the life of Babz Chula, Down River is a feature film written & directed by Ben Ratner, starring Helen Shaver, Gabrielle Miller, Jennifer Spence & Colleen Rennison. It tells the emotionally stirring story of three young women teetering on the edge between creative breakthroughs and personal breakdowns, and their connection with the older woman they rely on for guidance, support and inspiration. 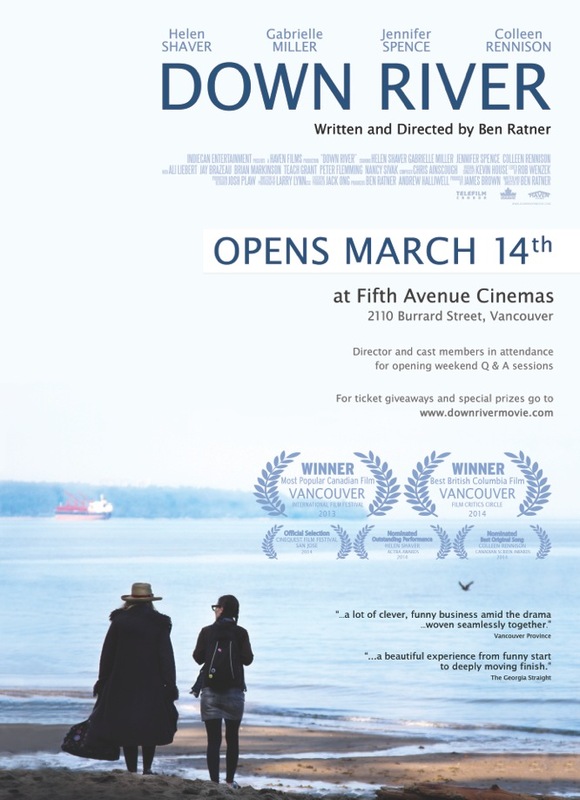 Down River opens at The Fifth Ave Cinemas on March 14th. Writer and Director Ben Rater will be on hand during the opening weekend Q and A sessions, along with several of the cast members, and producer, James Brown. We are hoping people will come out and see the film as soon as possible in the run and help keep our own films alive in theatres. The film also opens in Toronto on March 21st at the Cinemark at Yonge and Dundas. There will be two films showing at this year’s Vancouver International Film Festival: one is about her, and the other is inspired by her. The first is Down River. Written and directed by Ben Ratner, Babz’ dear friend and President of the Babz Chula LIfeline for Artists, the film follows three younger artists–women–who are mentored by an older artist. The three women were all connected to Babz in real life: Gabrielle Miller, Colleen Rennison and Jennifer Spence. The film follows the the three as they are forced to overcome their fears and face the future without the guidance they’ve come to rely on. It is a funny film about mentorship, friendship, and living life to the fullest. Writing the script was therapeutic for Ratner, it helped him to process his grief. The film was shot starting last year in June, and the director of cinematography was none other than Babz’ husband, Larry Lynn. It also features Jay Brazeau, Tom McBeath and Brian Markinson. The second film is a documentary called Chi. Filmed by Anne Wheeler while she travelled to India seeking healing from her cancer at an Ayervidic treatment centre in the last months of her life, Chi is ultimately about hope and letting go. You can read about Babz’ trip to India in her own words, here. Just this past week, we marked the second anniversary of the loss of our dear Babz. It’s amazing to me how her legacy continues to live on, how she continues to shine and inspire. Next month, Down River goes to camera. Written and directed by Ben Ratner, Babz’ dear friend, Down River is inspired by Babz’ life. Three women (a painter, a singer and an actor, all at various stages of their careers) are inspired to new heights by Pearl, a charismatic and caring older woman who lives in their building. But when Pearl dies, the women are forced to overcome their fears and prevail on their own. The film stars women who are all part of the Babz family: Colleen Rennison, Gabrielle Miller, and Jennifer Spence.